Inspired design, beautifully crafted stone kitchen worktops. 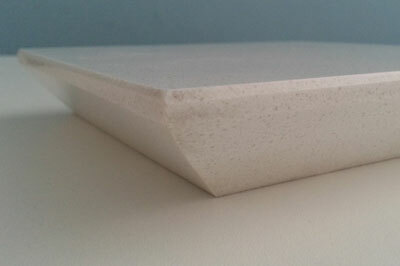 Edge profiles can add individuality and character to any worktop surface. When you choose your worktops you can select from a range of edging styles, from a standard flat edge (chamfered) or pencil round, to something more detailed. We can offer 8 styles of edge profiles, but if there is another you specifically want, we can normally accommodate it. Custom edgings will incur additional costs but can be spectacular and add a personal touch. Take a more detailed look at the types of Edge Profile available below. Square Edge or Pencil Round 30mmThis is the standard and most popular edge in 30mm stone. It leaves a clean, neat finish on the edge, with the sharp corners all shaved off to make it functional. A very simple and clean edge to suit all kitchen types. Includes 1x small rounded top corner and a small chamfer on the bottom edge. Full BullnoseA traditional style edge which is fully rounded, giving a softer feel than the square option. Half BullnoseThe Half Bullnose edge brings out the simplicty and boldness in a great design. You can never go wrong by using this edge. Double Pencil Round 30mmA 30mm thick edge profile with 2x small rounded edges on top and bottom edges. A very simple and clean edge to suit all kitchen types for the customer who wants no sharp lines. Ogee BullnoseThe Ogee Bullnose Edge offers a robust, bold and durable look. With the beefy curved edges, the Ogee Bullnose edge will help your worktop stand out and be noticed! Enhance your granite or quartz worktops further with these features below. We want you to know about our great promotions, blog posts and special offers, so we'd like to send you the occasional email. To stay updated and receive communications, tick this box. With our free consultation, we can get the right worktop for you fast. We offer a free home measuring service to take the hassle out. Sign up for Special Offers and Interior Design News. To Access Exclusive Offers & Industry News, enter your Email address below. This all takes about an hour. We take it from there to get you an ideal worktop at a great price. We consistently get 5 star reviews on Facebook, Houzz and FreeIndex. We take pride in giving our customers straight-forward, honest advice. Our service team will ensure your home is not disrupted when it comes time to fit your new worktop.